Improving conditions for wildlife in your back yard can increase the number and diversity of birds that visit – better for birds and for you. We all love to watch birds in our back yards, and putting out food is one way to attract them. 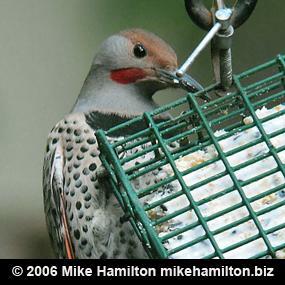 Most birds do not depend solely on feeders in their foraging. Many obtain less than one-fifth of their nutrition at feeders. Feeding can't replace natural habitat needed for winter cover and spring nesting and raising of young. And poorly maintained feeding stations can actually harm birds by spreading disease. If you choose to feed the birds, you need to be a responsible provider. Use tube-type feeders to reduce accumulations of droppings that can spread disease. If you use platform feeders, provide only a day's worth of seed at a time. Clean and disinfect feeders at least once a month with a solution of one part bleach to nine parts warm water; rinse and dry disinfected feeders thoroughly before re-filling. It's handy to have two sets of feeders, so one set can dry while the other feeds the birds. Pick up spilled food or waste from the ground at least once a week. Discard feed that is wet, looks or smells moldy, has fungus on it, or has been contaminated by rodents. Locate feeders where there is no place for cats to wait in ambush, but close enough to cover to allow birds to escape natural predators such as hawks. unless markers/decals are present on the outside surface of the window in sufficient density that birds will not attempt to "fly through the gap"
between markers. The standard rule is that gaps should be no more than 2 inches by 4 inches. See the Fatal Light Awareness Program and American Bird Conservancy's Solutions to Birds Hitting Windows for more information. Cornell's All About Birds can help you figure what types of seeds attract which birds. Creating habitats where birds can find nourishment and protection is ideal for the birds and rewarding for the humans. Provide region-appropriate habitat for the benefit of birds and wildlife. Native gardens can be easier and less expensive to maintain. Plant native species, which are adapted to your particular climate and thus don't need extra water. Throw away (responsibly) the pesticides and herbicides. Rid your yard and neighborhood of invasive plant species. Search for certified organic gardening products here. Create a brush pile of clippings, branches, and yard debris in a hidden corner of your yard, out of the wind. Birds will forage and hide in the pile. Before cutting down a tree (or other vegetation), think about who might call that tree home, or use it as a place to rest. Leave a snag for wildlife! And if a tree truly must come down, take it down outside of nesting season. Get more ideas at In Context or learn more at All About Birds. Many bird species, and the young of many more species, are vulnerable to cats. It will take a few days, for example, before an American Robin is able to fly out of harm’s way. With 70 million pet cats nationwide – and an equal number of feral felines – cats are a big problem for birds. Up to one billion birds are killed each year by cats (Humane Society). Unfortunately collar bells don’t help. A cat’s instinct is to hunt and kill. Yes, even a well-fed cat. Not ready to keep your cat indoors year round? How about during the breeding season, March through July? When you hear the distress call of a bird, go outside and have a look. Your presence may be a lifesaver. Keeping your cats indoors is safer for birds and for cats. Learn more at American Bird Conservancy or at Audubon. Trouble with House Sparrows Invading your Feeder? Cornell suggests that a "halo baffle" might work to deter House Sparrows. Check it out!